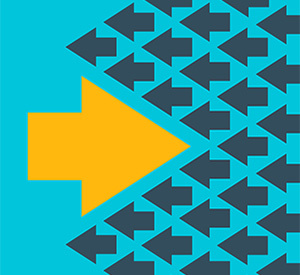 Are Bank And Credit Union Branches Dying? Or Not? If Murphy can have his own law, then so can I. Here’s Shevlin’s Law: For every statistic that proves a point, there are two that refute it. Nowhere is this more true than with the life/death of bank branches. But the total numbers don’t get under the covers of at least one important trend: Large institutions have acquired other banks, and closed many of the superfluous branches that were right next door to their existing branches. If you’re a fintech-loving branchophobe (like me), you conveniently ignore that explanation and attribute the decline to the impact of fintech. To show how easy it is to construct an alternative story line to the branches are dying narrative, consider this trend: Over the past 40 years, the number of branches per bank has grown nearly eight-fold (from 2.3 in 1977 to 15.8 in 2016), and in fact, grew by 50% in the 10-year period of 2006 to 2016. 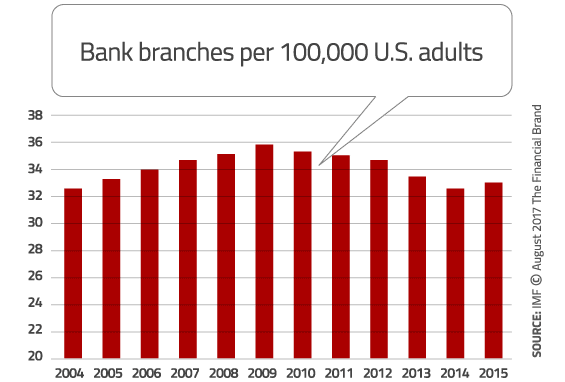 What the article didn’t mention, however, is that the “trimming” reduced the number of bank branches per 100k adults to where it was pre-crisis, and in fact, that number increased between 2014 and 2015. Old people want branches and young people don’t, right? 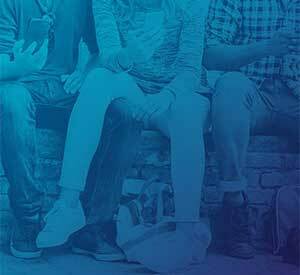 Oh wait, no, young people do want branches because they like to talk to people before making their decisions. I don’t know which it is — the data tells two different stories. 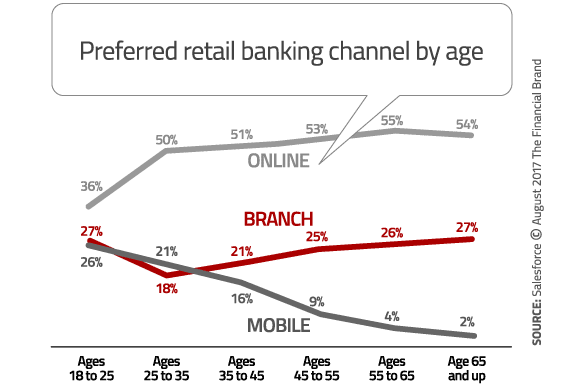 On one hand, there’s data from Salesforce that shows that consumers of all ages prefer digital channels to the branch, and in fact, the percentage that prefers the branch is a minority, and doesn’t vary all that much for consumers over the age of 35 (the top line represents online, the red line is branch, and the dark gray bar is mobile). 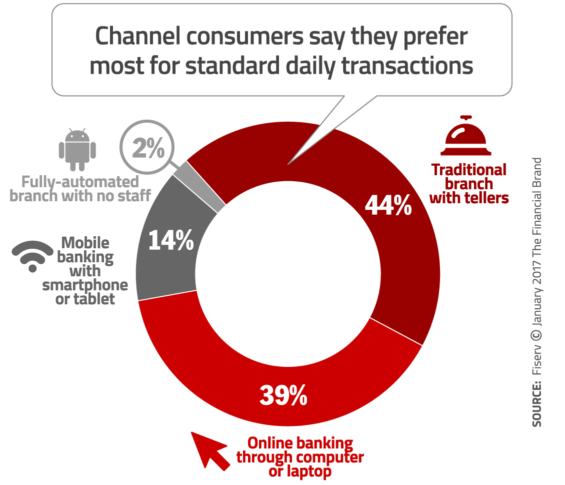 I’m not sure how to reconcile the Salesforce data with findings from a recent Fiserv study, however, which found that 44% of consumers prefer to do their “standard daily transactions” at a traditional branch with tellers. I find this really hard to believe. 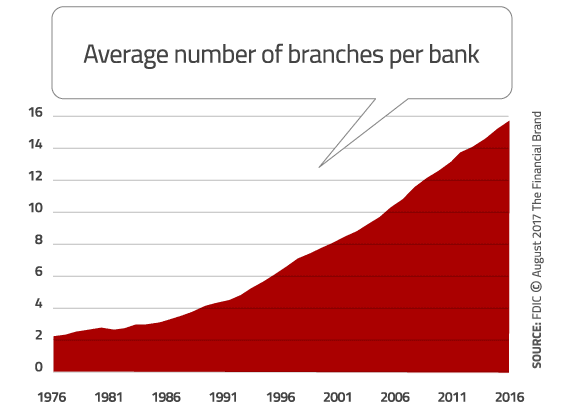 Another common narrative is that the size of bank branches is shrinking. One CNBC article claimed in its title that “Bank branches are evolving…and shrinking,” and that’s just one of many articles making that claim. 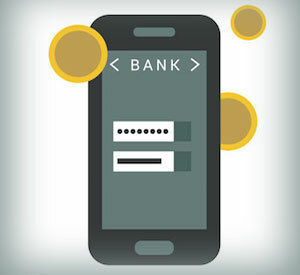 Another article here on The Financial Brand cited a study that shows the opposite, however. According to JLL, the average size of new bank branch projects is 8% larger than the average size of existing branches. And in fact, in the West, new branches will be 50% larger than existing branches. They grow ’em big out there, don’t they? The purpose of this post is not to refute the “branches are dying” narrative. I just wanted to point out that there’s data to support whatever argument you want to make about the life or death of branches. And I was hoping to build a little awareness of Shevlin’s Law. This article was originally published on August 2, 2017 . All content © 2019 by The Financial Brand and may not be reproduced by any means without permission.